As the partial government shutdown — now the longest in U.S. history — continues, employees at Big Bend National Park in far West Texas are in their fourth week of unemployment. In a notice on the park’s website, staff say they’re “using revenue from recreation fees” to fund the services. It remains unclear how much of the recreation fees are being used to clean the park, how frequent the janitorial services will occur and the exact extent of them. Marfa Public Radio’s calls to the park for clarification were unanswered, as BBNP’s media relations office is closed due to the shutdown. 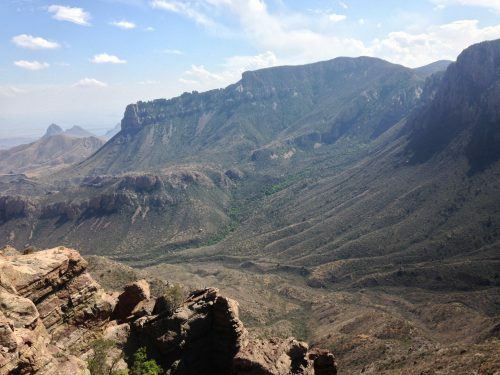 Resuming cleaning services, staff said will “allow the re-opening” of a few trails that were previously closed, including Old Maverick Road and the Santa Elena Canyon trails. This week, staff also announced the re-opening of one of the park’s book stores. “We came to an agreement with the park service to re-open the book store at Panther Junction only,” said Mike Boren, executive director of Big Bend Natural History Association, the group that oversees the park’s bookstores. Boren said the BBNHA “works with the park service, but we’re independent” of it. In past shutdowns, Boren said the association continues to pay its employees, who work offsite at the store’s headquarters. The BBNHA estimates the park’s bookstores have lost more than $65,000 in sales since the shutdown and roughly $12,000 in salaries. But while some park operations are returning, employees at the park continue to be furloughed. And now some West Texas food banks are teaming up to get these remote federal workers what they need until the shutdown is over. “We have the park, so that is our main concern right now is those employees,” said Libby Campbell, executive director of the West Texas Food Bank. Campbell said her outreach team has been working with the Terlingua Food Bank to help employees at Big Bend National Park. Right now, she doesn’t have a head count for those who need aid at the park, but her group is planning to set up a station in Terlingua where workers can pick up necessities. The West Texas Food Bank says they will continue to provide aid to those who need it as long as the shutdown lasts. This entry was posted in KRTS News and tagged Big Bend National Park, Government Shutdown, West Texas Food Bank. Bookmark the permalink.